Keep on track over the course of a day or even two. Aim for a balanced day. "It's more important to meet the dietary guidelines over a day or two than to meet them at every meal. I try to have only one meal a day that has refined grains. That generally leads me to eat more fruit, veggies and dairy. I use the Menu Planner at mypyramid.gov once a week to double-check that I'm keeping on track." 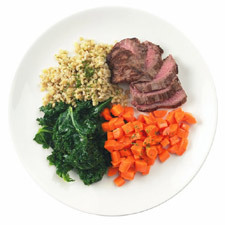 Editor’s note: Check out EatingWell’s Menu Planner to get you started. Fresh vs. Frozen Vegetables: Are we giving up nutrition for convenience?